I've been crafting as a hobby for a long time, but ill health has meant that I've spent more time on it lately as it is something I can do even when confined to bed. In addition to the cards that I make for uploading to CUP, I've also made bilingual wedding stationary for family members and lots of other different types of card, some of which can be seen on my website. 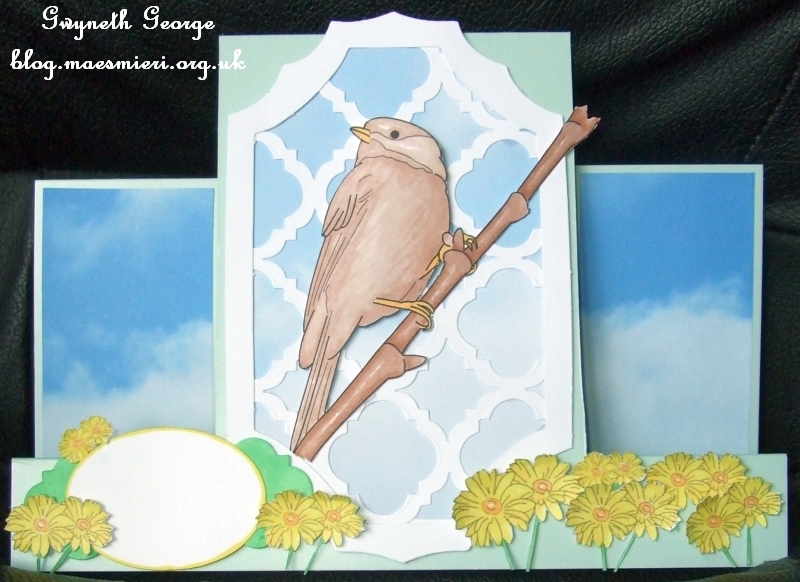 In this blog I'll try to note how easy or difficult any particular card has been to make. 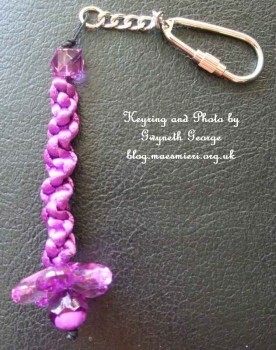 In addition to making cards I make some bits of jewellery (when my hands allow) and knitting. I use to knit with needles and make everything from cabled patterns to socks, but I can no longer hold up and manipulate needles, so I've swapped to knitting on looms/knitting boards the last couple of years and am having fun trying out lots of new yarns to get different effects as oppose to complicated paterns. 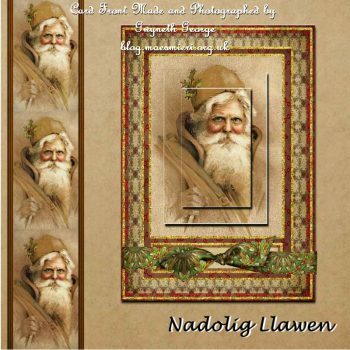 The theme for August is “Christmas in August”. 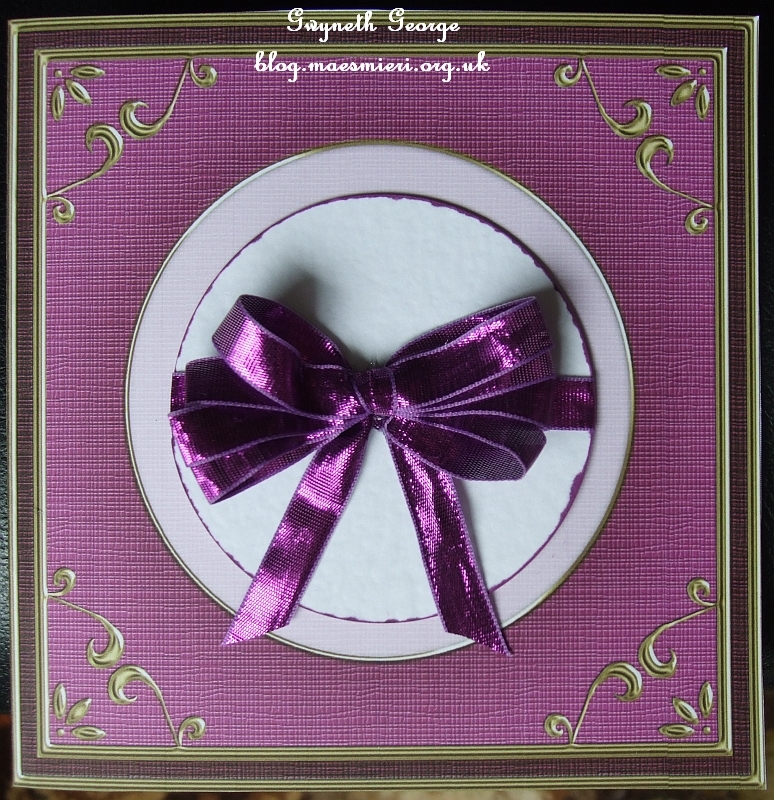 If you are like many a crafter you will already have started to make your Christmas cards and other projects, so blog them and enter them and you could be lucky and get the DLD voucher at the end of the challenge. 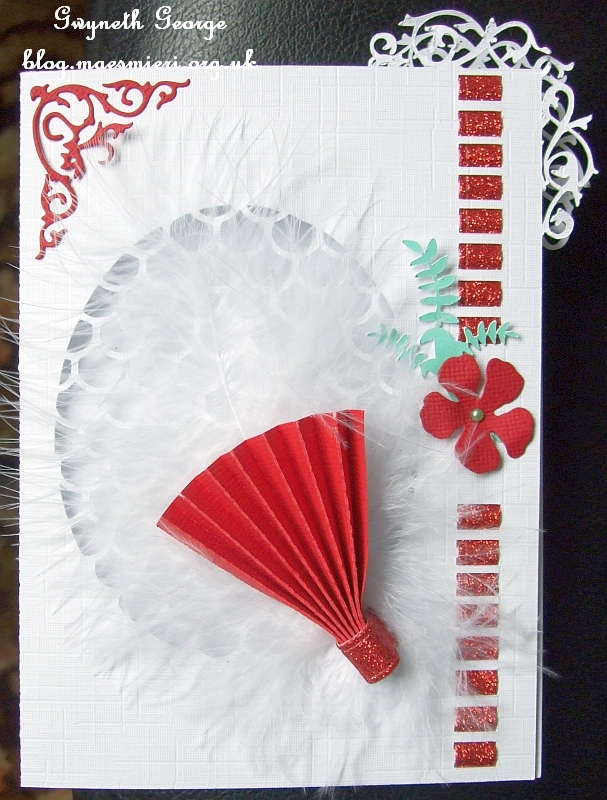 I decided to use items from a Dragons Lair Designs collection called Victorian Christmas. The collection contains a sheet to print off to make a rectangular pyramage card, but in view of the popularity of square cards at the moment I decided to have a play around with this sheet, together with other items from the collection, to create a square card front, with the illusion of dimension, that can be printed out at 4″ square to just about 8″ square (when a printer allows printing to the edge). I started off by taking the pyramage card topper sheet into the software, resizing it, and copying it so I had 3 copies. I then used the rectangular digital punch in the software to cut out the three layers of the pyramage. I then put these one on top of the other, matching up the image, as if I was working with the printed out image. Once the layers were in place I used the DropShaddow effect and Blur Radius to give the layers the impression of being raised on foam pads or dimensional glue. I then took a background and tied ribbon element from the collection, put the background behind, positioned the “dimensional” pyramage, and added the tied ribbon. 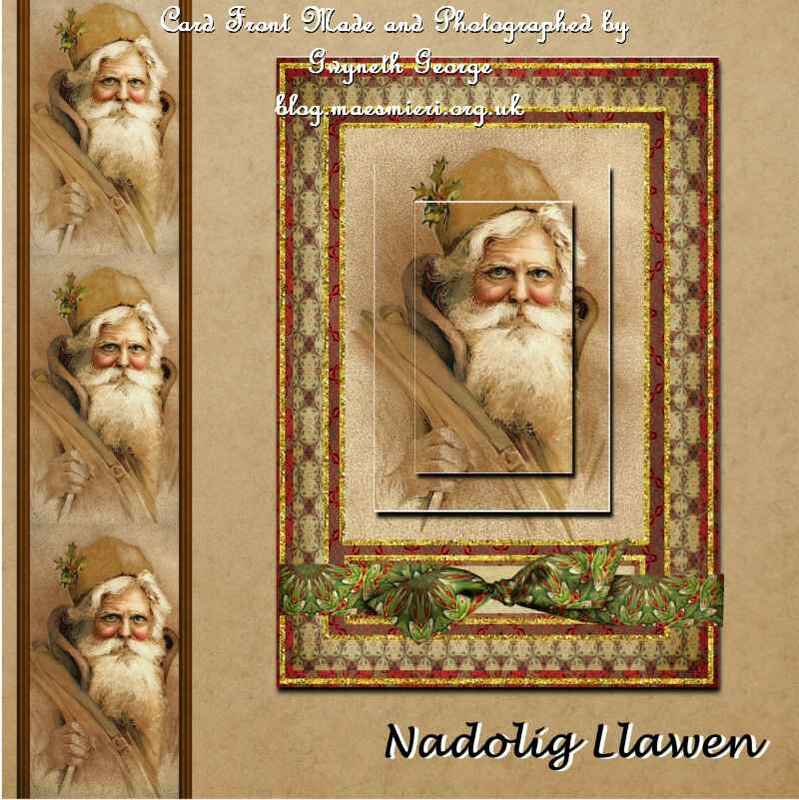 I then added the greeting “Nadolig Llawen” (which is Welsh for Merry Christmas). I typed it in black, copied it, and changed the one behind to white. I then moved the black layer slightly to give an ofset look. This is now ready to be printed off at a variety of sizes. I’ve been doing a bit of a tidy up of my crafting stash with the help of a nephew. Not got as far as I’d like, but have found a lot of pre-cut and scored square card bases in a variety of sizes that I can just measure and print out these card fronts at the right size, cut, stick on, and decorate with a little glitteraround the frame. 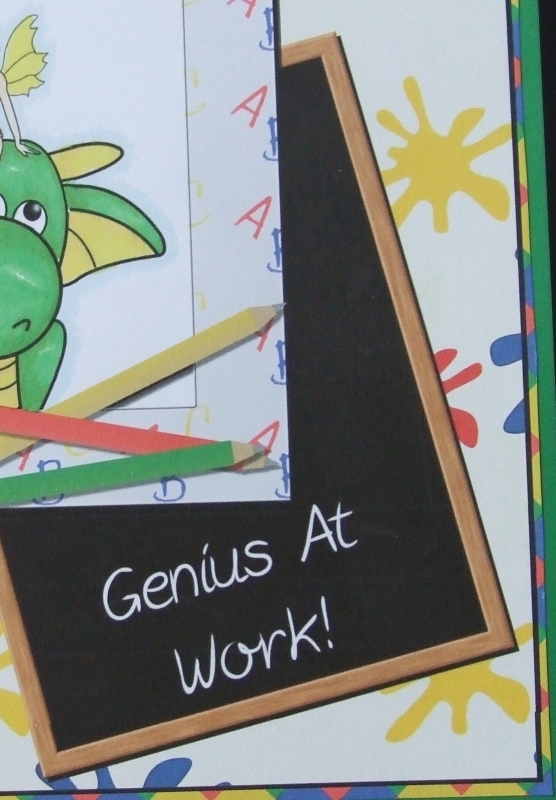 With postage being expensive for dimensional cards, using software to get a dimensional look but only actually sticking one sheet of cardstock on a card front, it keeps the weight of the card down, and using the smaller square base cards will keep the dimension of the cards small enough to go through the post using a standard stamp in the UK. 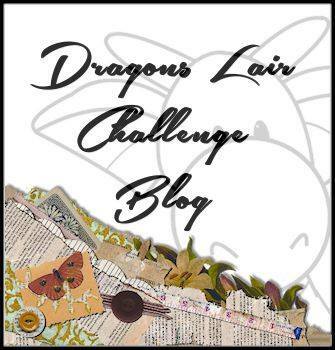 Today a new challenge starts on the “Dragons Lair Designs Challenge Blog“. The title “New Beginnings” can be interpreted in so many different ways. You may be thinking in terms of the New Year, so your creation might be a New Years card or calendar, but you can also think in terms of a new job, new baby, new home, an engagement or wedding with the happy couple starting a new beginning together. I decided to go for a totally flat, one layer, card this time. Something I’ve not done in a while. 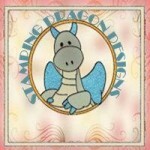 I took papers and elements from the kit, together with the digi-stamp, into my My Craft Studio software. With the paper set to A4 portrait I worked on the bottom half of the working area, building up my design how I wanted it using the digital punch as well as resizing, etc., features in the software. I added a drop shaddow of various width to the layers and then printed the design out onto cardstock. I used my new Chameleon pens to colour in the digi-stamp in shades that worked with the colours of the background. I finished off by scoreing the sheet and folding it in half. “Babi Newydd” is Welsh for “New Baby”. I’ve tried to take an angled photo of the card to show that it really is flat and that the look of dimension has been created by giving “shadows” to the layers and elements in the software. 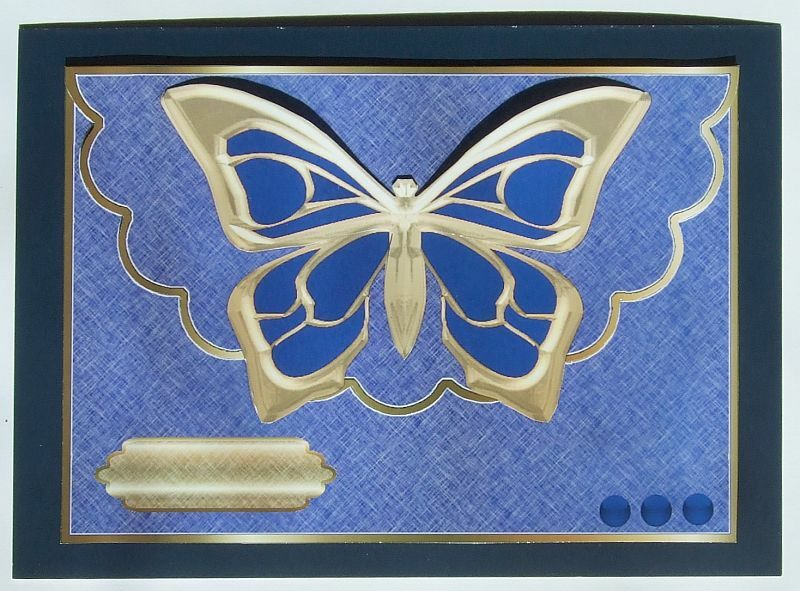 And here’s a close-up of an area of the card front. Today a new collection has launched in the “Dragons Lair Designs Shop“ and as a member of the Dragons Lair Designs Design Team I got my hands on part of the collection ahead of time to work with. 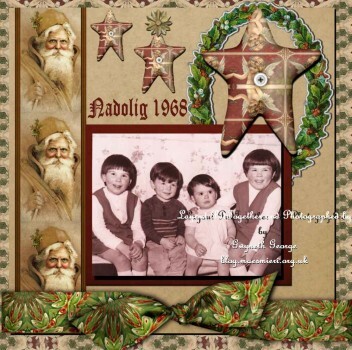 The new collection is in a lovely vintage style – and as the title suggests – is all about Christmas. Although it is lovely to make all sorts of creations ahead of Christmas for any sort of crafting, don’t forget that it can be used after Christmas to scrapbook photos taken during Christmas, or, if like many, you have old family photos sitting in a box that you’ve promissed yourself you scrapbook with at some point during the coming year then you are sure to find something in this collection to use with them. One old photo and elements from the collection only used for this layout. 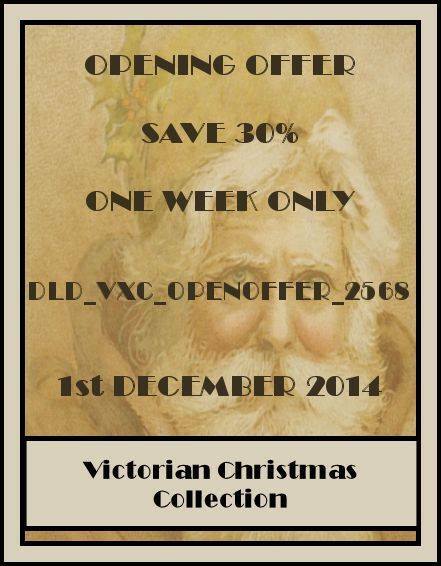 Items from the “Victorian Christmas” Collection – found – Here – in the shop. There’s even a DISCOUNT available for the 1st week! 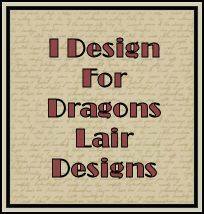 You can see some more, very varied, items made by other Design Team members on the “Dragons Lair Designs Inspiration Blog“. 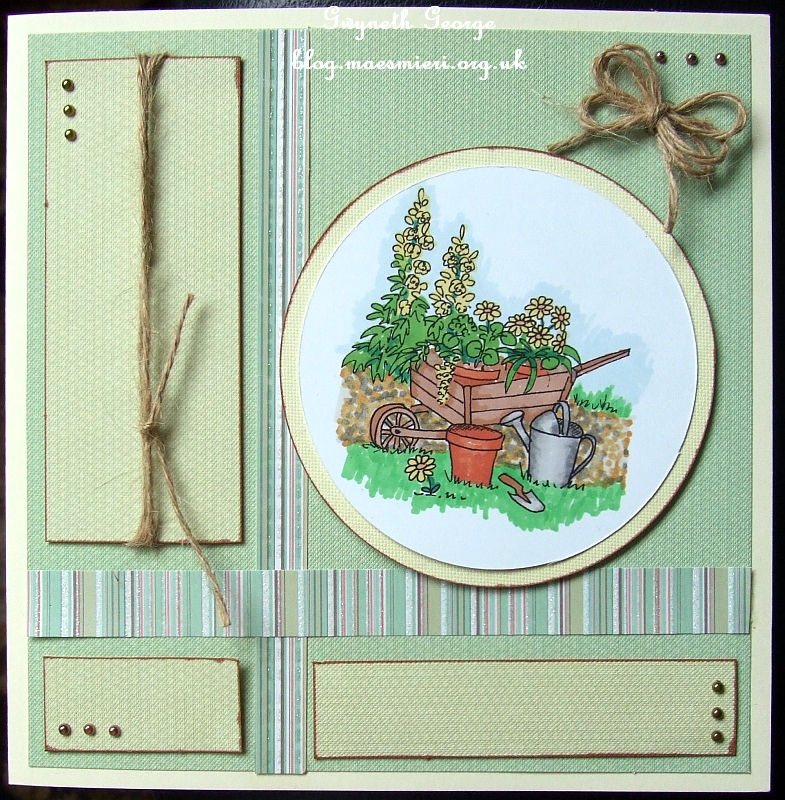 Please pop over there for a look, and remember to go to the store to see all the various papers and elements available in this lovely kit. If you don’t want to read my musings, or know what I used and how I made a card you can just click the thumbnail images to view each card at a larger size, and then click “Back” and scroll down to the next section. I know that I write a lot in each blog post – this helps me remember what colours or cardstock I’ve used in case I want to get a similar effect in the future, in addition to providing information that some readers might be interested in – so please don’t think that you have to read every word I’ve written. I had a bit of a session of crafting Thursday and yesterday. Didn’t get as much done as I wanted, especially as a lot had already been coloured and cut out ahead of time, but at least it’s a bit done. Christmas is getting nearer – and I’m slowly getting my Christmas crafting done. But people are already talking about having their decorations up. No chance! We’ve never put up decorations this early. I like having time to sit and enjoy the decorations when they go up, and there’s no time to do that until Christmas itself. So with us the decorations go up during the last week before Christmas – when we were young I remember rushing home when we were let out from school after lunch the last day of term to put up the decorations because the holidays had arrived – and we had to thoroughly dust and hoover the sitting room before putting anything up. I’m guessing that those who put up decorations earlier do so because it was a tradition in their family when they were growing up to do so. I’m wondering what everybody else’s traditions are as far as Christmas decorations and their Christmas tree – do you put everything up early? Do you take them down as soon as Christmas has been? Do you like to put them up just before Christmas day but sit and enjoy them once Christmas day is past – not taking them down until a week or two into the New Year? And what about the Christmas cards you receive? Do they all go up in a prominent position? All hung but overlapping? Or do you only have room to put a few favourites on display, or perhaps swap them round over the holiday period? It facinates me how the cellebration of one event – the birthday of Jesus Christ – can have so many different traditions associated with it, not only around the world but even within one country. 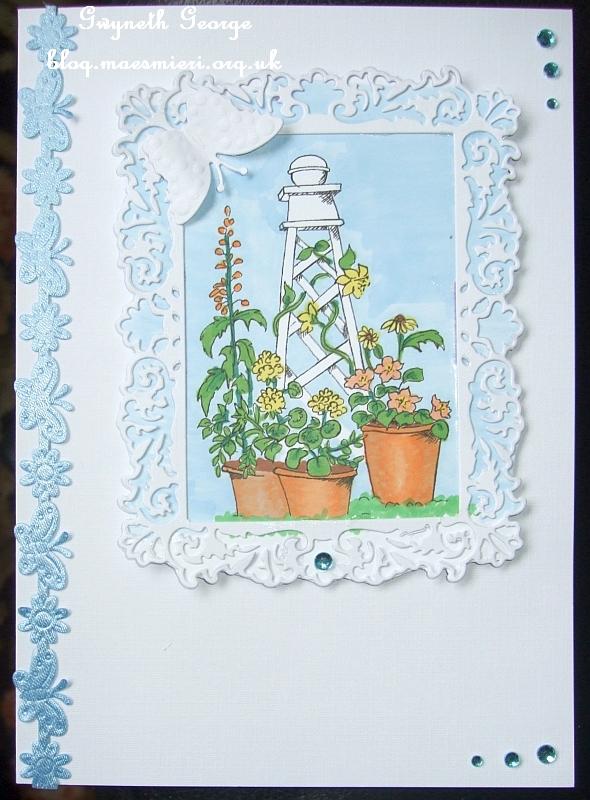 This is one of my recycle/upcycle cards where I’ve chopped the front of a card off to use as a topper on this new card. It is attached to the front of a 6″ square, scalloped edged, card from my crafting stash and I finished it off by spotting blue glitter glue around the edges. 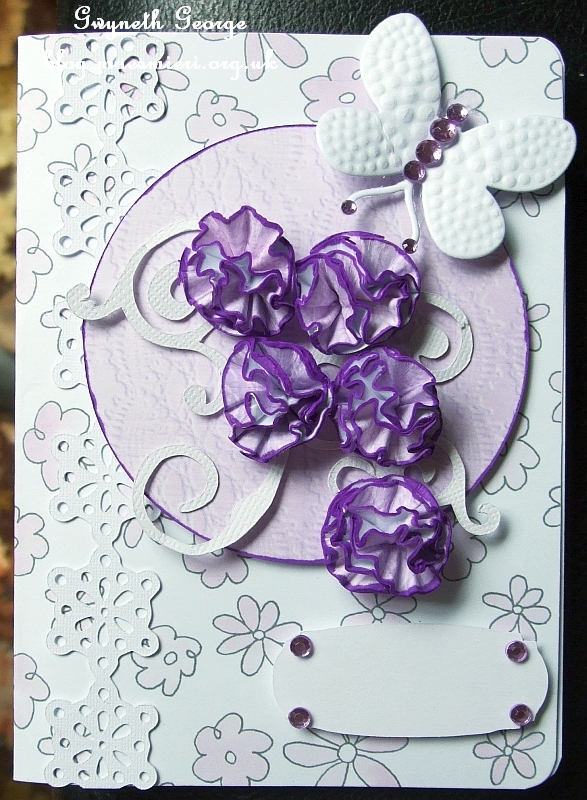 Another card with a bit of sparkle but still flat enough to go through the post on a standard letter stamp in the UK. One of the groups I belong to on Facebook, called “Let’s Make Marks” , is running an event called “Tickled Pink” at the moment. 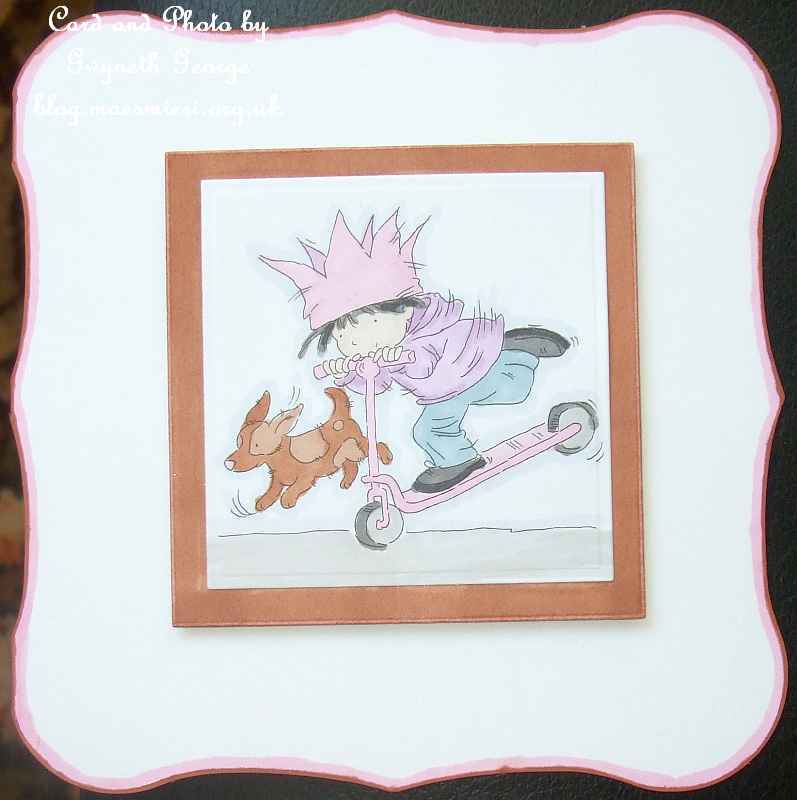 The idea is to create crafty creations incorporating markers with a PINK theme. Photos of the creations are to be uploaded into the event album in the group, and the cards themselves are to be sent off to the event organiser. After the closing date mid December the original works will be distributed amongst Breast Cancer Charities for them to sell towards their much needed funds. The image is from a “Collection of 3, A6 Black and White Sketch Pads” of Lili of The Valley images. I coloured this in using: Cool Grey 3, April Shower, Pink Carnation, Rose Pink, Blossom, Coral, Cocktail Pink, Pastel Pink, Henna and Satin ProMarkers and Dove Grey FlexMarker. 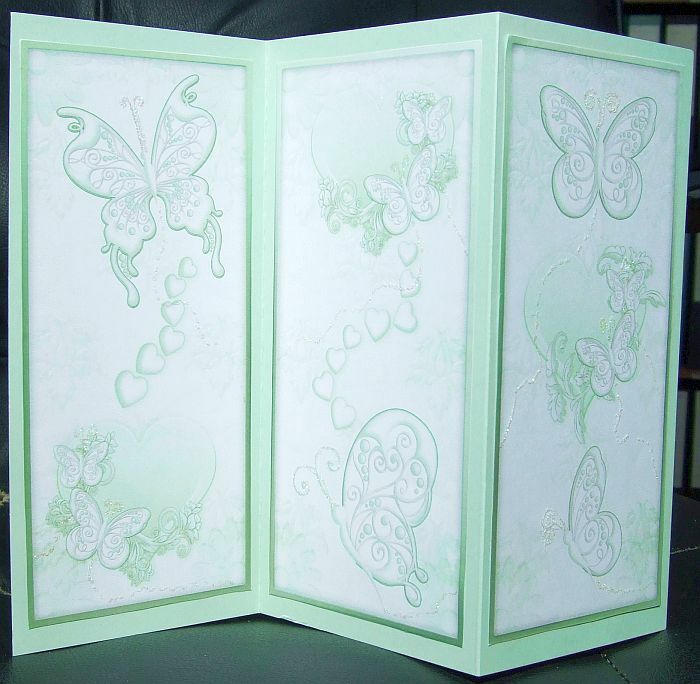 I cut out the image, and a small greetings panel, out using the Spellbinders Distressed Edge set die. 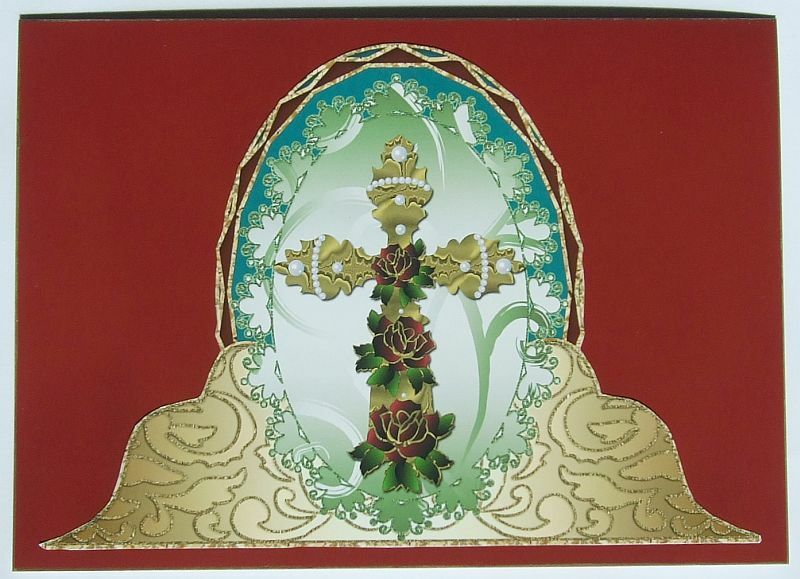 I also cut mats one size larger out of flourish foiled Adorable Scorable cardstock. I coloured in a white cardstock in a blotchy pattern using the pinks I’d used on the image and cut these out using flower dies from a Spellbinders die set . 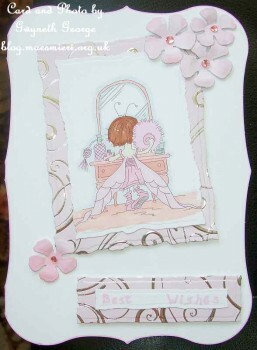 I went round the edge of a pre-cut and scored card with Pink Carnation ProMarker. Attached the top layers to the flourish mats using fingerlift tape and then used 2mm deep, double sided, foam tape to attach the matted layers to the base card. Glue gel was used to attach the flowers and I finished off with some pink sticky back gems. Angled view of same card. 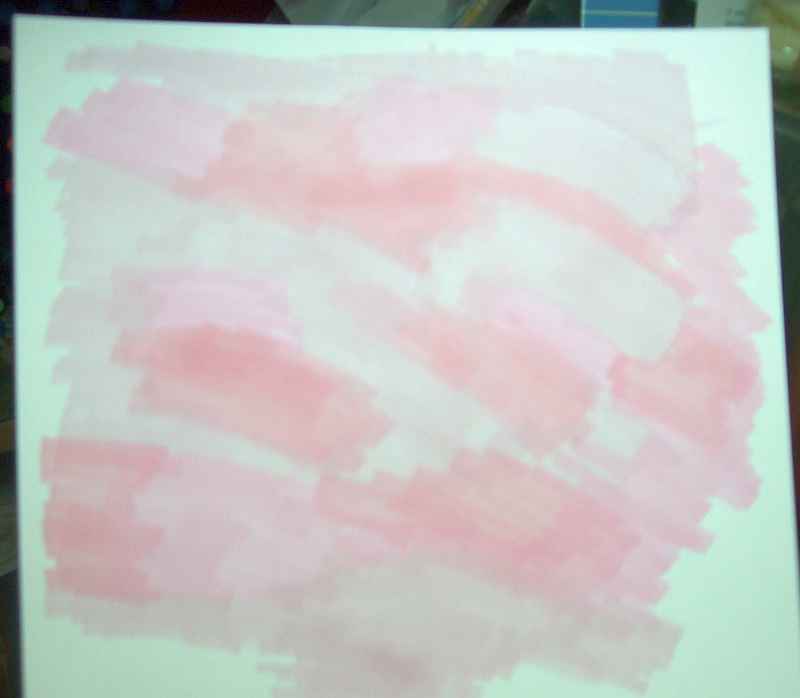 The piece of 300gms Super Smooth white cardstock I coloured in blotches of the pinks I’d used to colour the image. 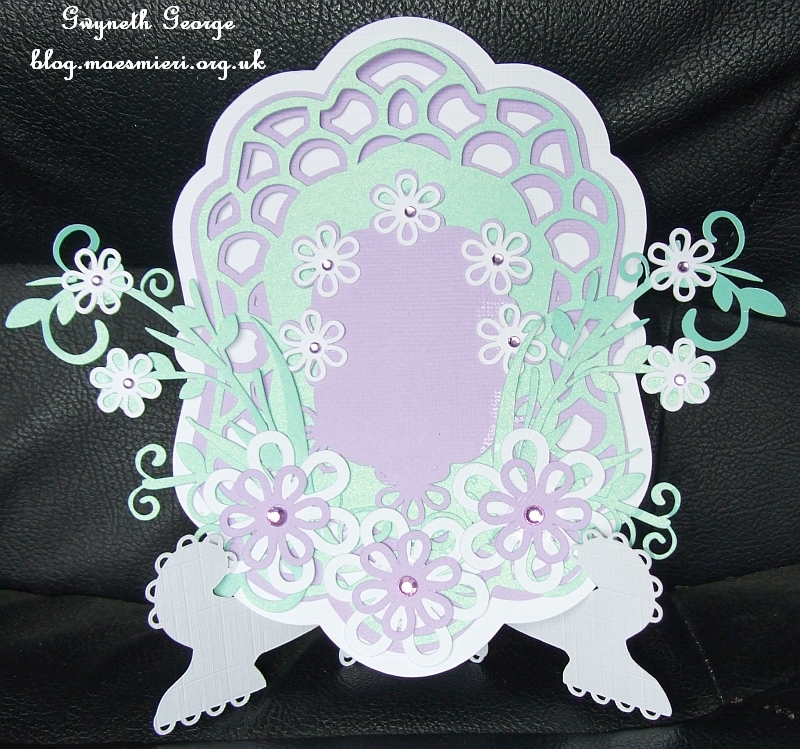 This is what I used to die-cut out the flower embelishments for the previous, and the next, card. 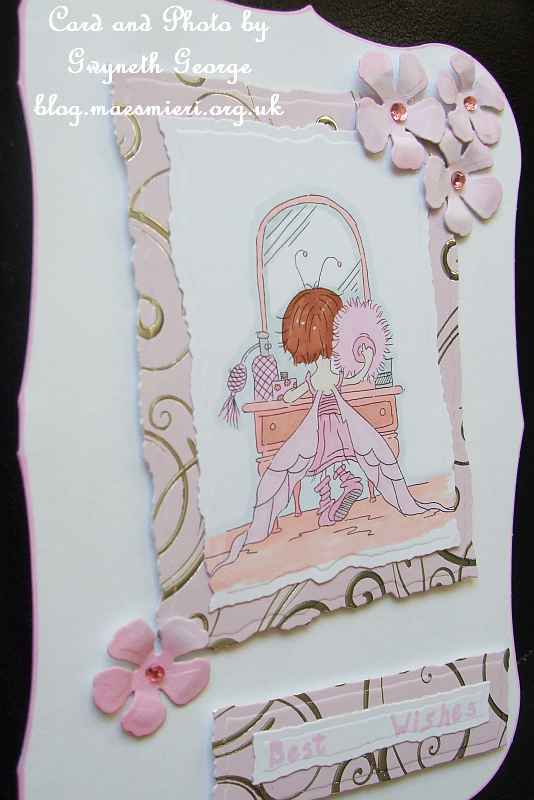 I’d cut out more flowers out of the ProMarker coloured panel than I needed for my 1st “Tickled Pink” card, plus some flourishes and a butterfly (the flourishes are from a Marianne die set and the butterfly is from a Joy butterfly die set), so I decided to use some of them to create another pink card. 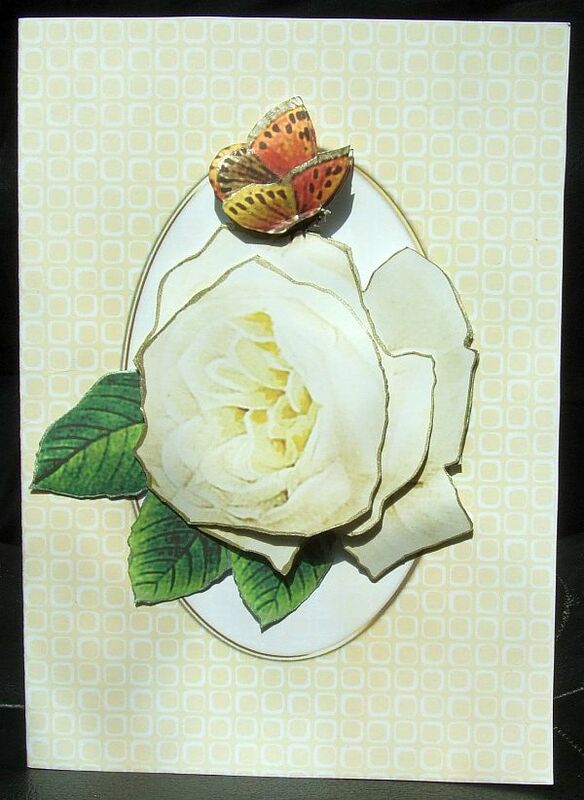 The base card is from the same set of blank cards as the previous card and I went rougn the edge of this with a Pink Carnation ProMarker. 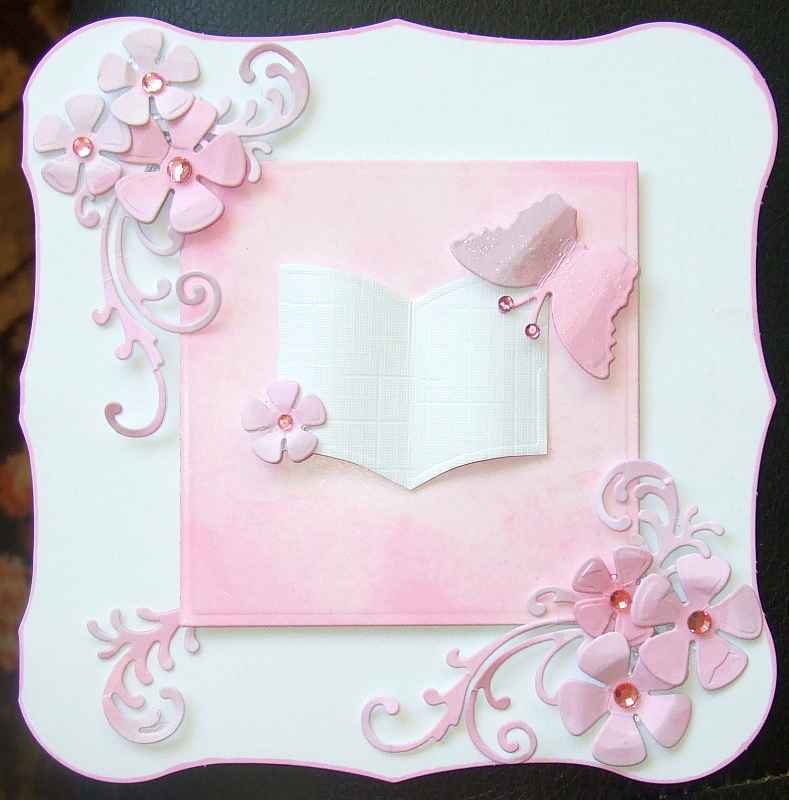 The mat was cut out using a Spellbinders Square die out of a pink, marbled look, Score Perfect cardstock. I used foam tape to attach the square and then glue gel to attach all the embelishments, finishing off with some sticky back pink gems. This card isn’t quite as “pink” as the previous two. The image is from the same LoTV pack of black and white outline images as the first card, and the first time I saw this image I thought that the little child looks as if he’s dome something a bit naughty and is now legging it. I then thought – what if what he’s doing wrong is playing with his little sister’s nice new pink scooter? 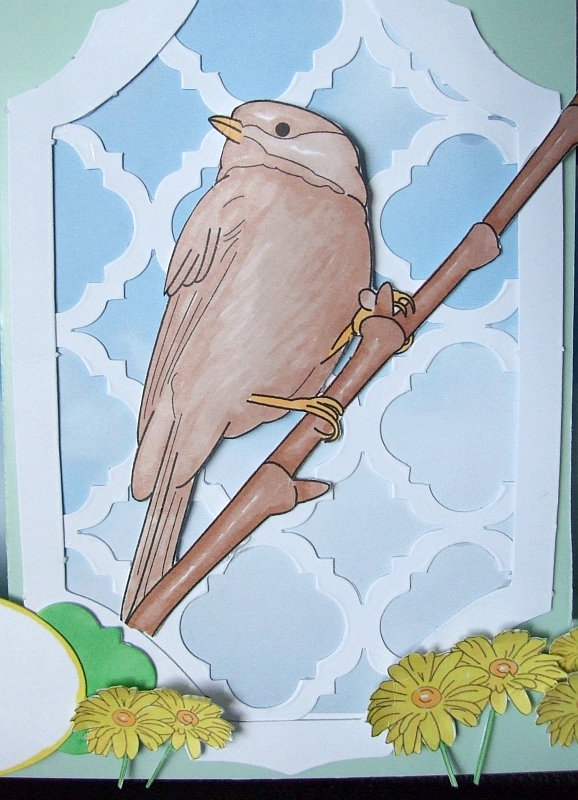 I like pink and brown together so I used the same type of base card as previously for this one and then went round it firstly with a Pink ProMarker to put quite a wide border, then with a brown ProMarker to give a very narrow line right at the edge. Both these ProMarkers were used to colour in the image. The colourse used were: Amethyst, Cinnamon, Cocoa, Cool Grey 5, 3, and 2, Black, Denim Blue, Satin, Orchid, Blossom, Pink Carnation, and Dove Grey FlexMarker. I cut the image out using a Spellbinders Square die and used one sized larger to cut out another square out of white Super Smooth cardstock. This white panel I coloured with the same Cocoa ProMarker I’d used on the dog in the image so that I had a perfect match as a mat for the image. Finger-lift tape was used to attach the image to the mat and 2mm deep, double sided foam tape was used to attach the matted image to the card front. 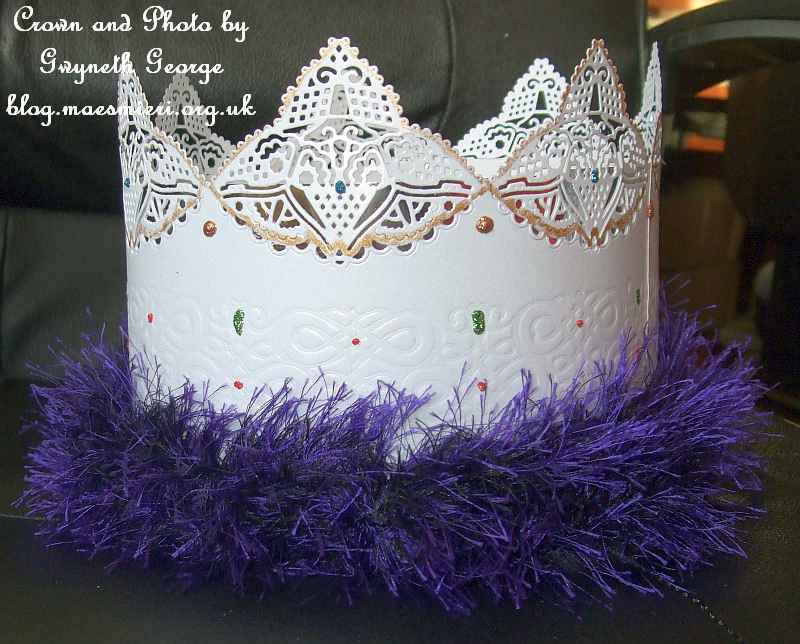 Last week I took all my distress Inks , a bag of makeup sponges, some The Three Kings StenSkape stencils and some cut up pieces off a roll of white poster paper – and yes, I did remember to put down a covering before letting the children loose to create their pictures. Of course, it isn’t easy to blend with makeup sponges on poster paper, but the children had fun and it kept them quiet while other stuff such as sorting out the order for the Christmas services was being attempted. These are not what the children made though. Some of them have taken their creations home and the others have left them in the vestry until this coming Sunday School as they want to add finishing touches. 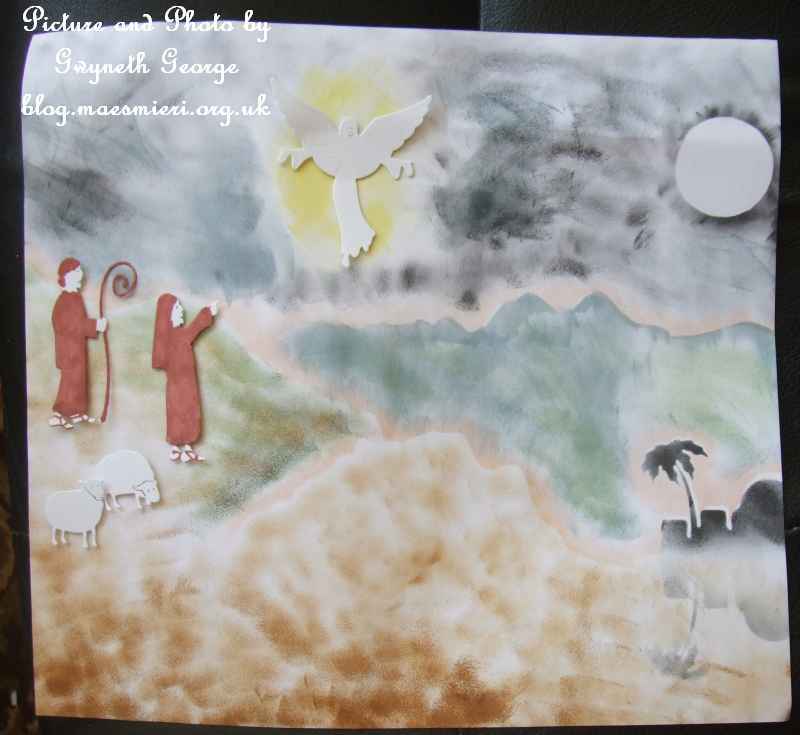 What interested me was that they’d all gone for very sandy colours with the nativity manger, but none did the journey of the wise men or the shepherds in the fields at night. So being me – I had to have a play myself when I got home – not taking much time over it I must admit, just doing something to fill in the gaps in the story. 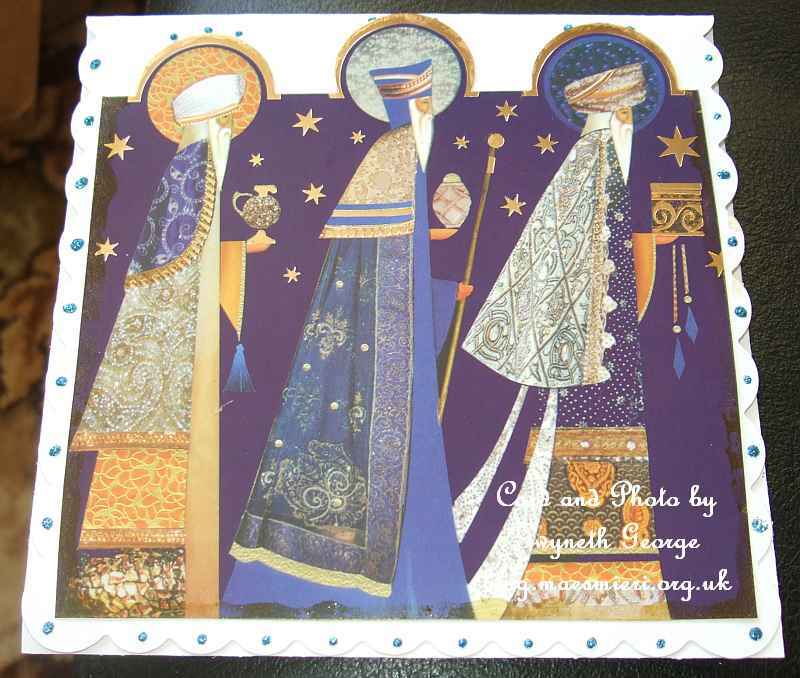 As I said – not easy to make anything other than a very textured look with what they were provided with, but I finished off my creations with die-cut a die cut star, an angel, shepheards and sheep cut out using Signature Dies – Nativity 2013 from Joanna Sheen. I used my ProMarkers to colour the shepherds and added some clear Wink of Stella to the angel’s wings. 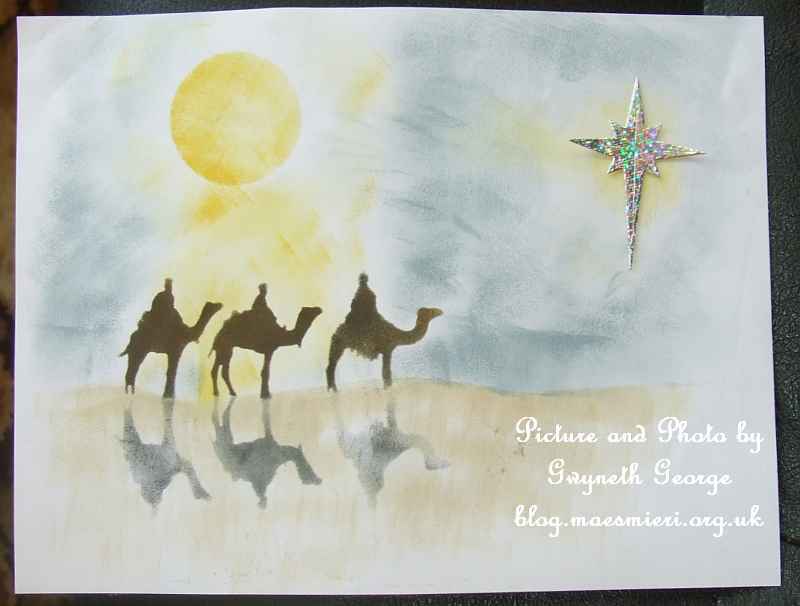 Wise men following the star as the sun goes down. Shepherds watching their sheep spot the angel. 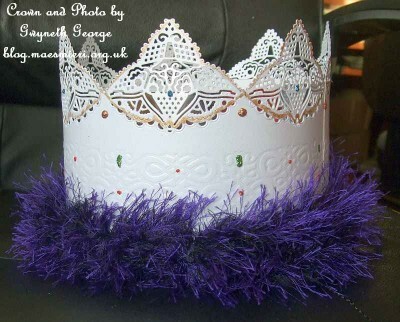 This is Herod’s crown. 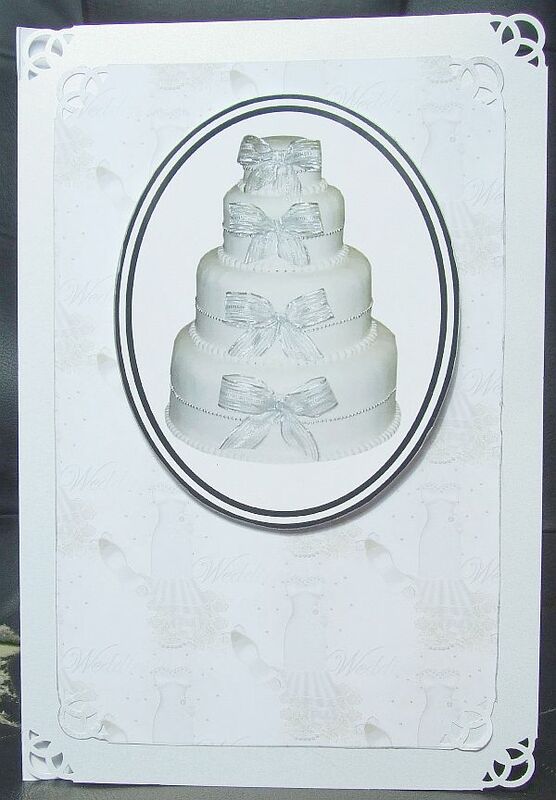 The base is made of Centura Pearl Snow White cardstock. One A3 sheet was cut in half along it’s length and I then die-cut the pattern at the top out of it with a Tattered Lace Die. While I had my Joy machine out I also embossed along the length of the cardstock using a long mask. I used super sticky tape to attach the two pieces together to make a long strip. 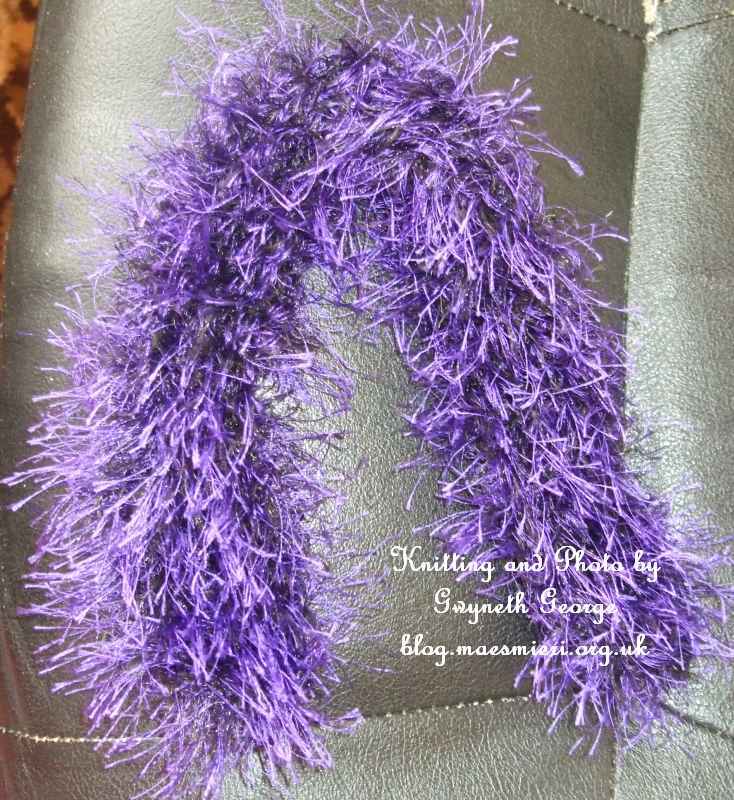 I took some Sirdar Funky Fox purple yarn and knitted a strip over 6 peg pairs on my knitting loom until it was long enough to wrap around the length of the joined cardstock. I put some holes around the bottom edge of the cardstock and threaded pieces of the yarn through, then round the bottom and round the knitted strip and knotted in place. I did this every 2 or 3 inches. Before joining the other end together I went round the cut out top section with gold coloured Wink of Stella brush pen and added spots of various colours of Martha Stewart glitter glue . This strip was knitted on the same knitting loom from the rest of the Funky Fox yarn and Herod can have it pinned across the front of his cloak as it isn’t long enough to go all round the neck and down the sides of the cloak. 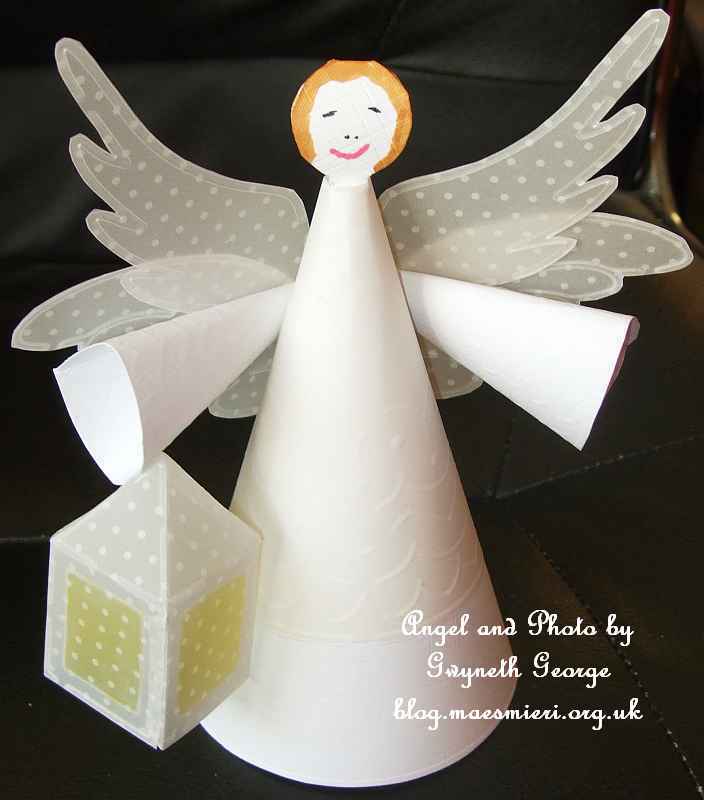 An angel made of linen textured white cardstock and white parchement, stuck together using ultra tacky tape and quick grab glue. I used a stencil to emboss the outline and pattern before cutting the pieces out. The same macrame knot as used in Shamballa bracelets was used for this one, but always going from left to right, rather than alternating both sides, to get a twist rather than a flat knoted piece. 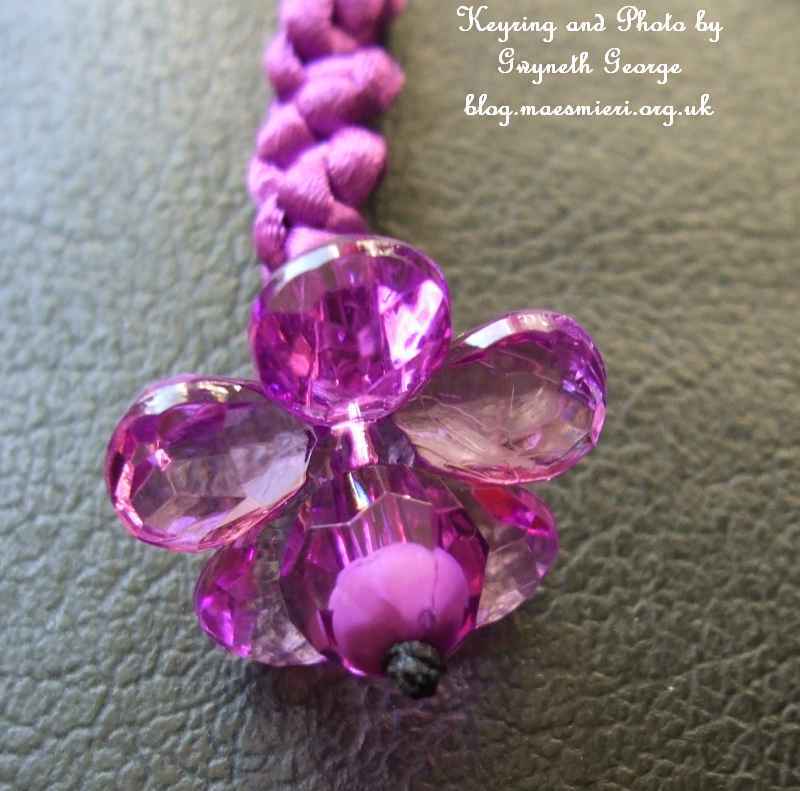 Closeup of flower end of keyring. 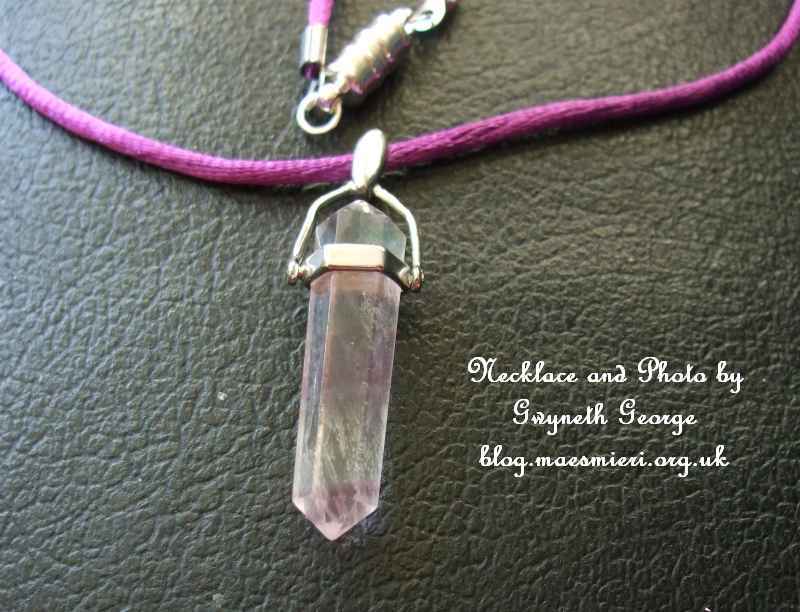 A simple cord necklace with a stone on a bail as a pendant and finished off with silver toned findings including a magnetic clasp. 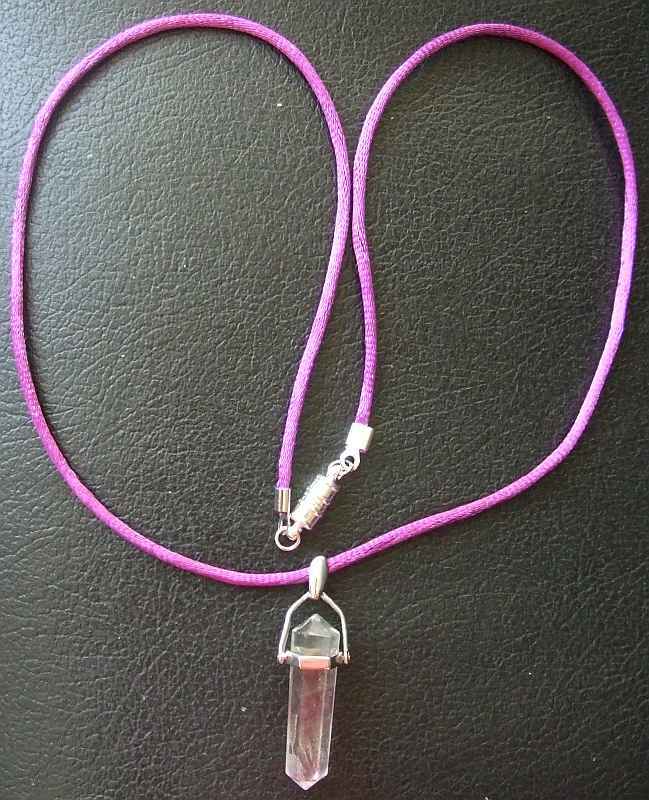 Closeup of the pendant. It has a faint vain of the same colour as the cord I chose. This is again a knotted item that’s knotted to produce a twist. This time it’s a mobile phone charm with two different sizes of Sodalite beads used in it. 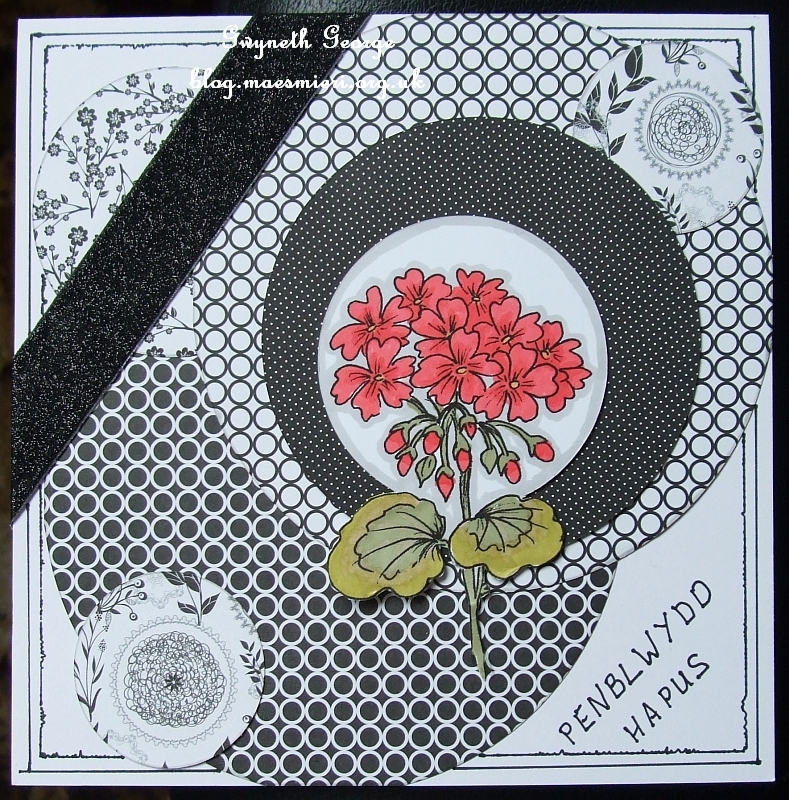 Have a look – here – at my whole shop Siop Crafftau MAES MIERI Crafts Shop on craftybob.com. 20% Off Discount Code – The news from CUP HQ this week is that this will be the last month ever when they issue a 20% discount code at the end of the month – which is something they’ve done regularly for quite some time now. They have promised that they will bring more discounts in the future, but more spread out and at different times of the month, so saving up a wishlist for a regular spend at a set time of the month looks as if it’s a thing of the past. So make the most of this last code as the next code, whenever it may appear, may not even be for 20%. 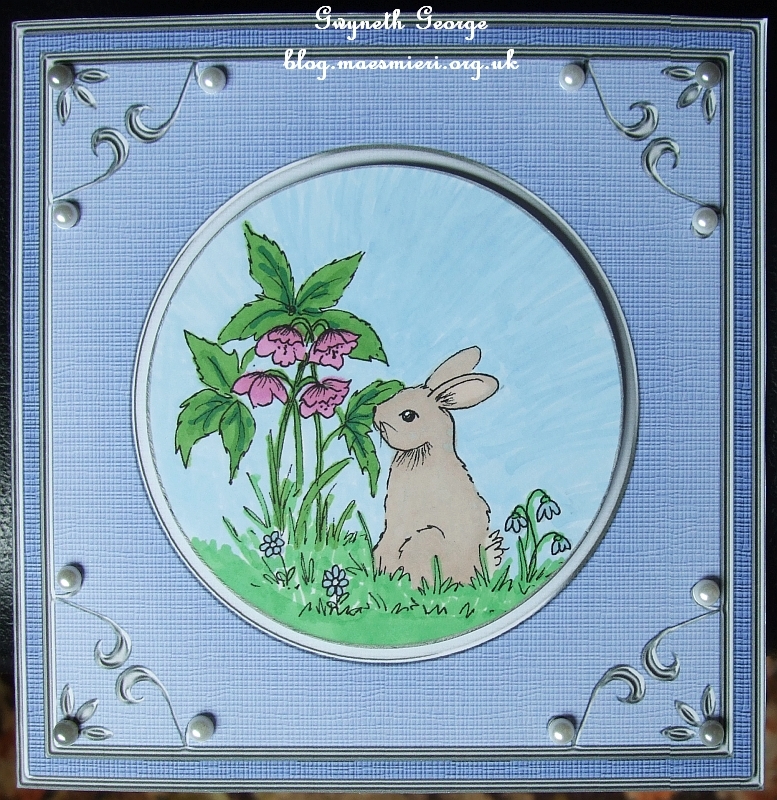 You may remember that I’d put a card up at the start of my blog post of the 12th June that I was entering into several challenge blogs. 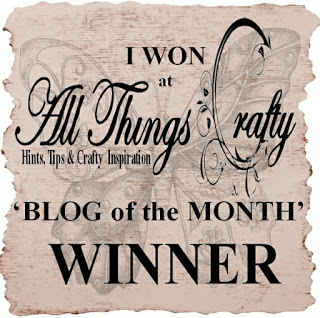 Well I went back to the Through the Craft Room Door Challenge Blog today and spotted that I’d won the prize for the week June 11 – June 17, 2013. Whoopee! With so many entries I never expect my number to be chosen, so it was a lovely surprise. 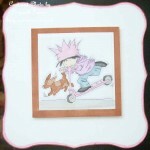 I need to have a look again at the challenge blogs and see which ones I’m going to make a card for next. I’ve not made a huge amount of cards so far this week. One was cut out using my Silhouette Cameo a week or two ago but I hadn’t put it together and decorated it. 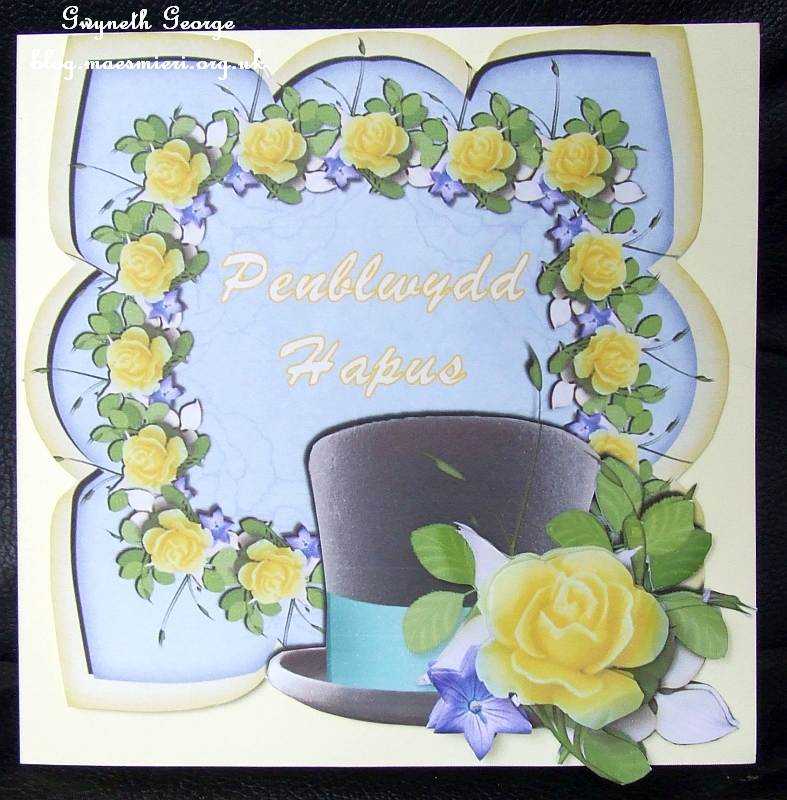 The decorations on this card, plus some that I’ve got on another card, were also things I’d cut out both using my Silhouette Cameo and also using dies some time ago. 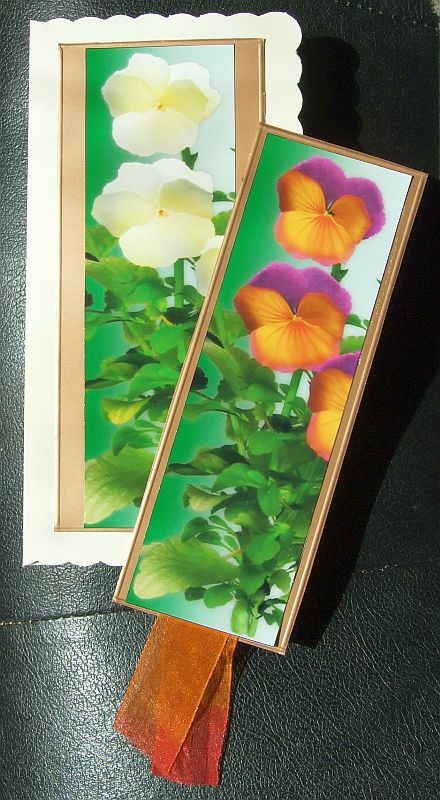 When I”m cutting out using either dies or electronic/digital cutting files I like to fill the cardstock with general flourishes and flowers and the occasional butterfly, and then keep these spares in a bag to use at a later date. So some of these have been used up on a couple of the projects I’ve got to show you today. I hope you like the assortment I’ve got to show you today – remember that you can leave a comment to let me know what you think at the bottom of the post if you feel like it. 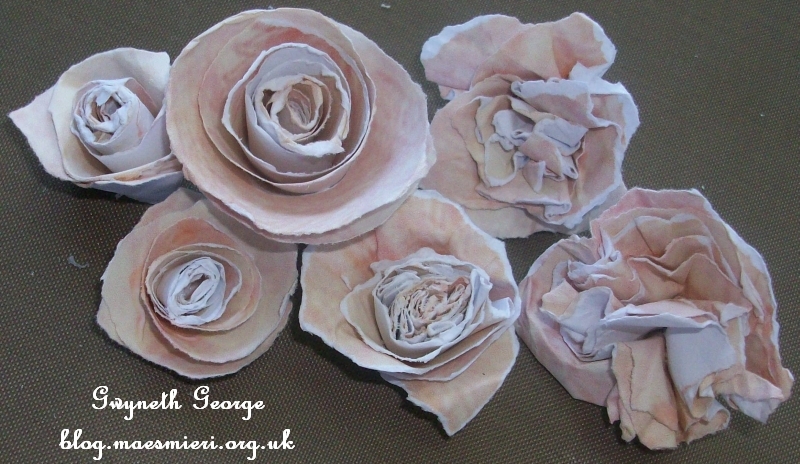 I’ve not added anything new to my two tutorials sections lately, but if you look here -> Paper Flowers : 05 – 06 – you’ll find the instructions on how I made the flowers on the third card of the first batch above in section 6.
and also thank you to everybody who’s left comments on my previous blog posts. I’ve finished a small number of cards yesterday, some of which I created with a view to entering them into some challenges. I then went looking to see if I could find a couple more challenges I could enter them into, by which time I was too tired to finish writing this blog post. I’m not always sure that I’ve got the themes and rules absolutely correct. So, if you have come from a challenge blog please disregard my entry if I’ve messed things up and the card under the challenge name doesn’t match the requirements. 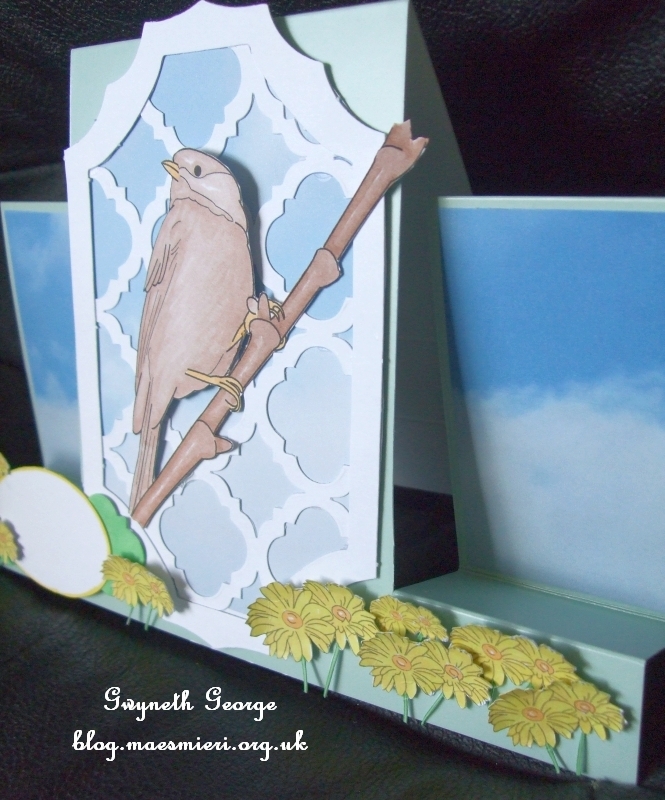 When I think of spring I think of blue skies, and birds singing in the branches, and flowers growing, and that is what has been the inspiration for this first card. 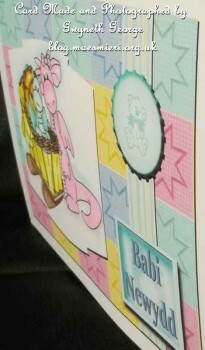 This is an angled view of the same card to show that I’ve introduced dimension to the cut out digi-stamp images. A closer look at the coloured in bird. 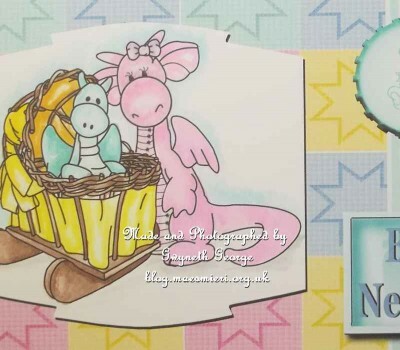 A closeup of the coloured in digi-stamp. Closeup of the sentiment written in white on the blackboard element from the kit. The dimension on the card is all created with shadows in the software, the actual card front is totally flat. 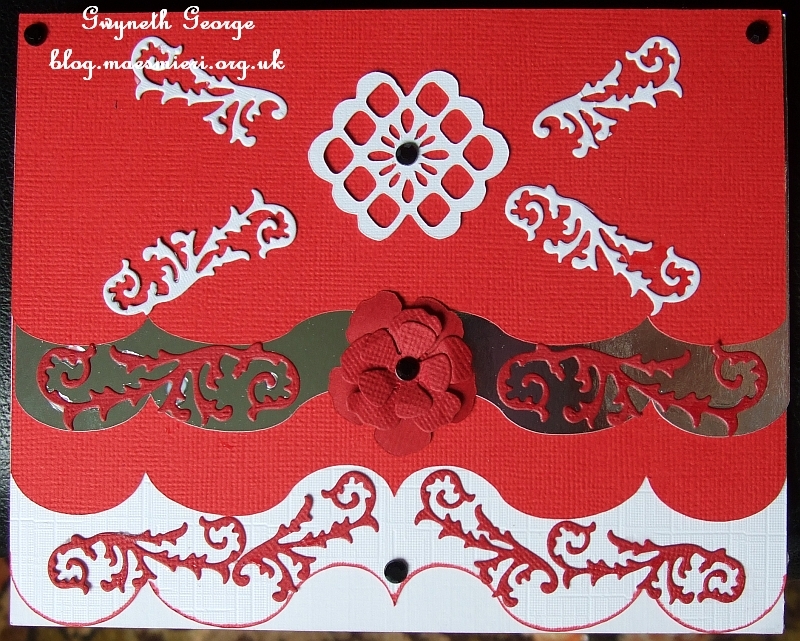 With no fiddly cutting at all, this card wasn’t difficult to make at all. I’ve only got two cards and a bag to show you today. I hope you like them and feel like leaving a comment at the end. Closeup showing the dimension of this card. 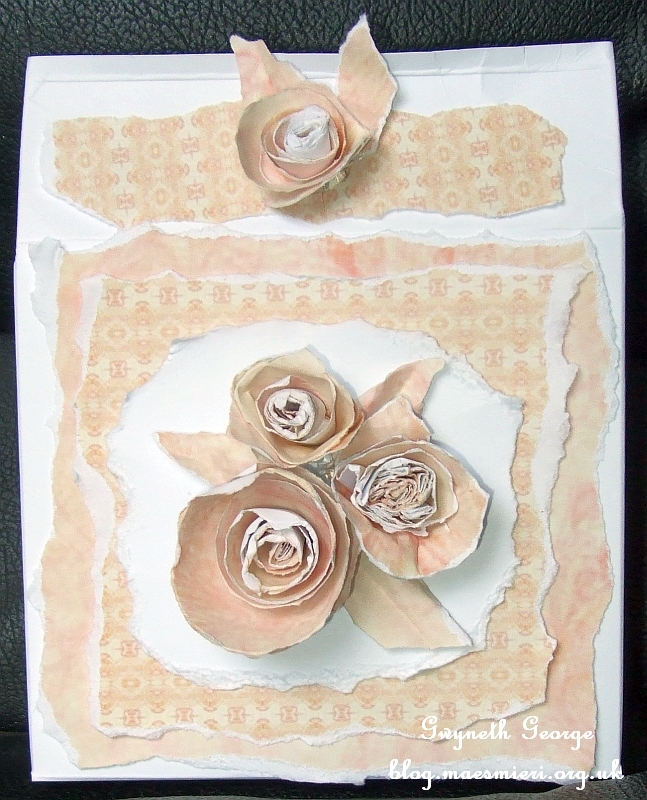 It’s been ages since I did anything with torn, rather than cut, items on it – so I went mad with this one and tore all the layers for the matting and layering, as well as tearing all the flower and leaf embellishments. Closer look at the flowers used. Monday, 29th April – Here! – You’ll find lots of designs by the top selling CUP designers showcased in this mailer, plus favourites from the top Registered Crafters. 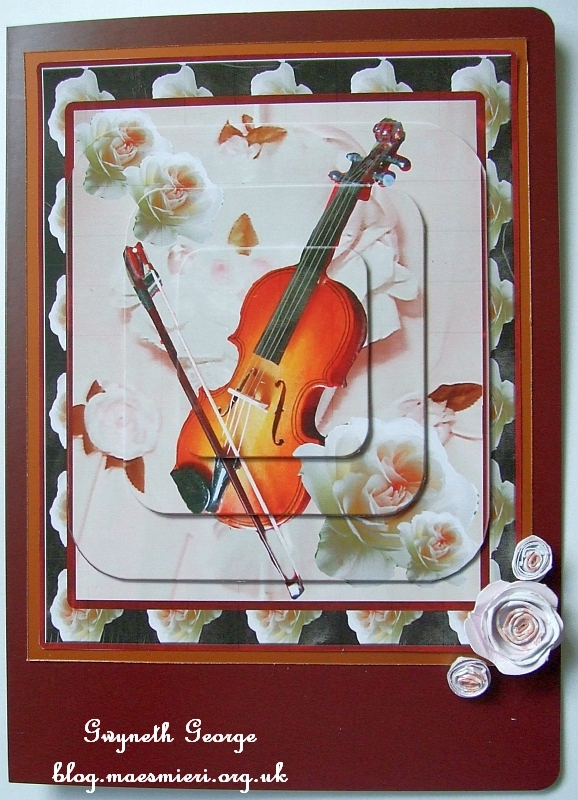 The “Chocolate” coloured background from the first pack was used as the main background, the “Champagne Satin” from the second pack was used for the ovals, and the flower layers were punched out from an assortment of shades of backgrounds printed from all three packs. 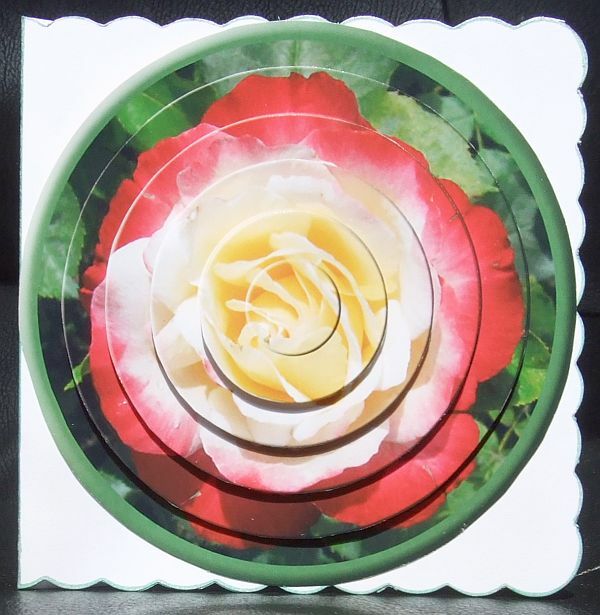 I think using background designs which have a graduation of colour gives a nice look to the flowers when shaped and the layers built up like this. You should be able to read my description of how I made the card by clicking – here – but if you have any problems seeing it the let me know and I’ll copy the description over to my blog. 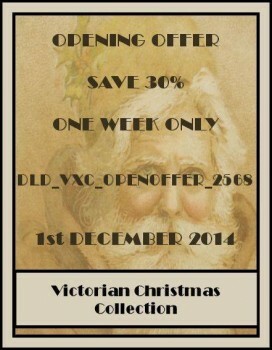 Discount Code – The discount code is still available until MIDNIGHT 30th November 2011. 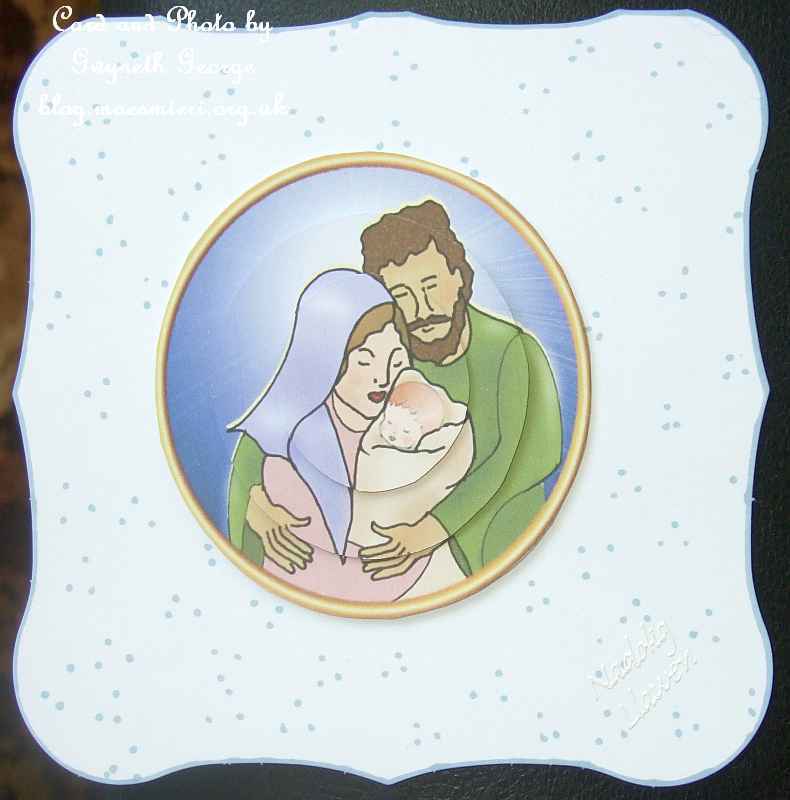 The instructions are simple – Go to the craftsUprint site, choose any design sheets, kits, cutting files, etc., you want to buy and pop them in your cart/basket then – Simply type the word SANTA into the REDEEM VOUCHER box on the basket page BEFORE you check out then click UPDATE BASKET. CUP Newsletter Mailer – A copy of the mailer sent out via E-mail on Monday, 29th November, can be seen by clicking – here. 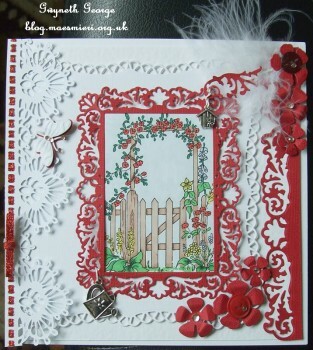 There’s a CUP TV episode with Sarah Edwards demonstrating on of her “Card in a Card”cards; A showcase of Silvia Griffin‘s ‘Curvy Top Folded Cards’; The “Card Maker Spotlight” falls on Geri Stringer this time and the “Designer Spotlight” falls on some of the Christmas cards designed by Sandra Carlse; plus lots of other designs and news for you to look at. 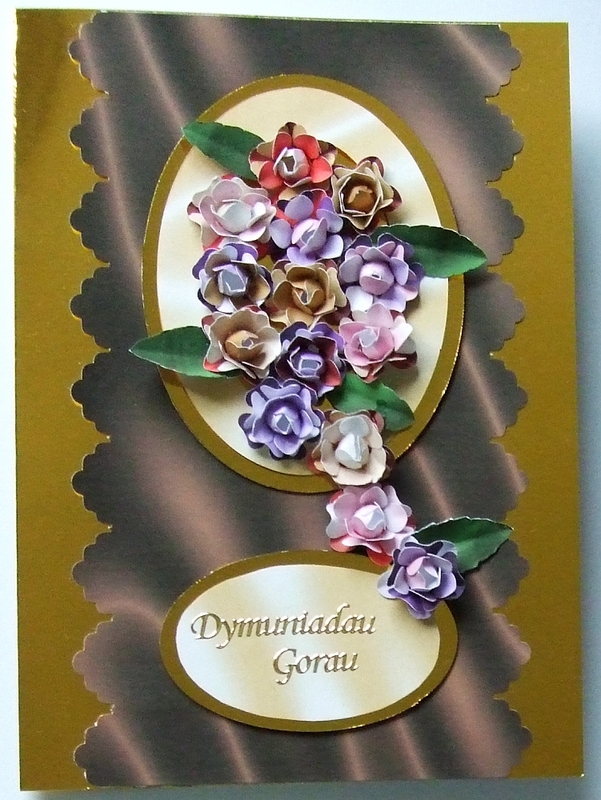 Card Making Competition – Don’t know why the voting was stopped two days before the date of the 30th of November given in the competition information, but it was, and the winner was announced early. The winning card was a really lovely one created by Cynthia Massey. You should be able to see it by clicking – here. I’d like to thank those who voted for my card entry, and also thank those who left such lovely comments below it. I actually managed to put together a few cards yesterday, as well as get tidy pictures taken and get the pictures uploaded to craftsUprint. Mind you, I had done the printing and cutting before then, and I have several more to do. But it’s a start. Two of the cards involved backgrounds as well as toppers of various sorts so there are 12 CUP sheets involved. 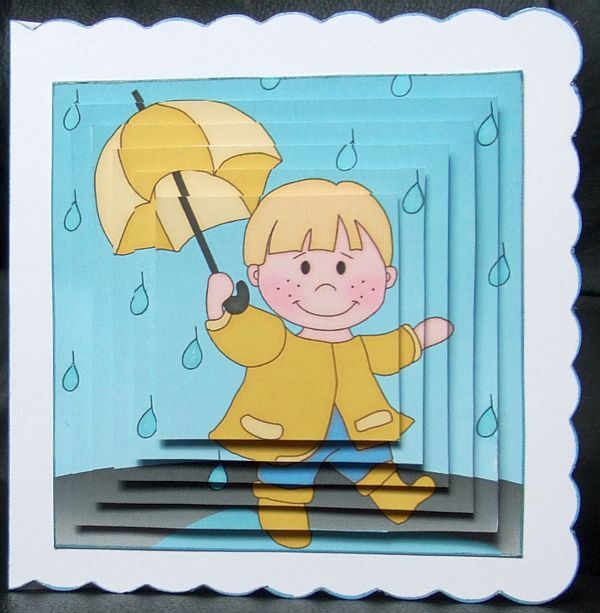 Have a look at the card pictures, and if you like the look of any then click through on the links beneath and you’ll get taken to the sheet I used so you too could have a go at making them. But you don’t have to make them up the same way as I did. I’m sure you can come up with other ideas. 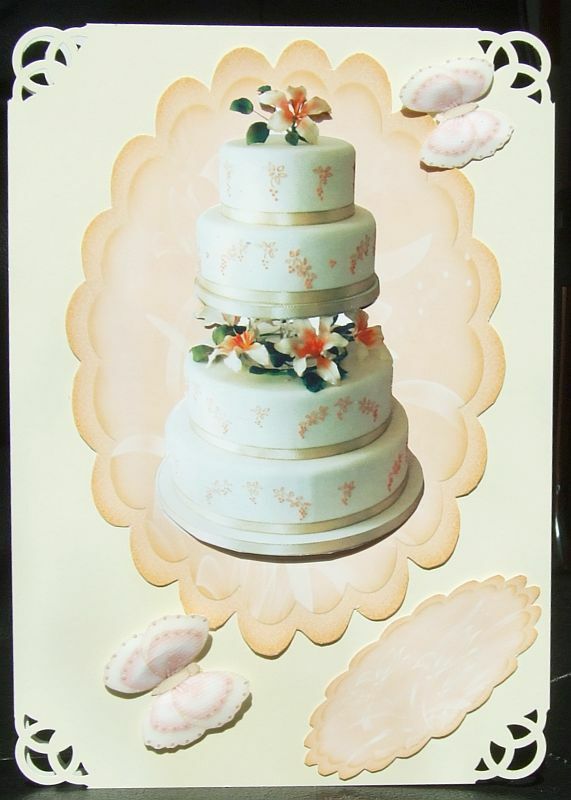 GROOM 2 by Carol Brown and Wedding Dress Vellum by Michelle Johnson (A paper punch was used to give intricate detailing to this card, and the topper itself is just a simple to cut oval, so this card was a very easy one to put together. 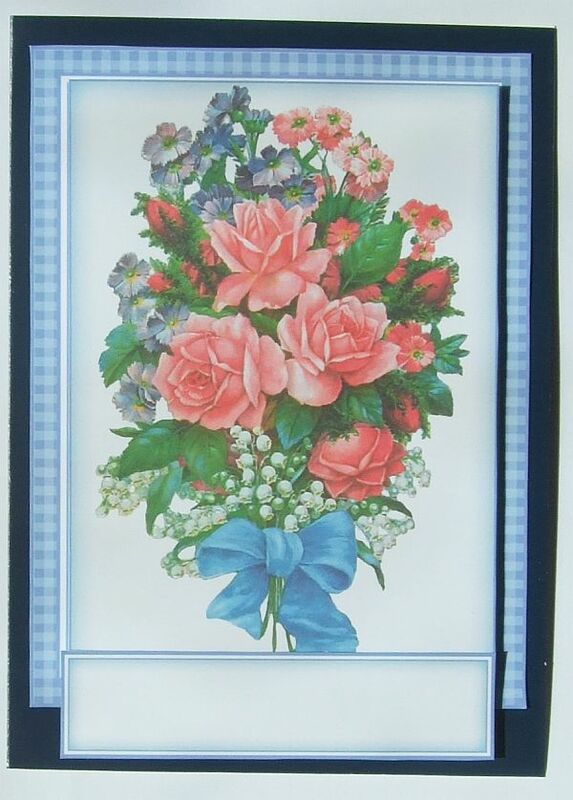 There are now over 60 entries to the June 2011 Female Birthday Competition uploaded to the card gallery. Even if you’ve not been a craftsUprint customer in the past there’s still enough time to go to the site, buy a few designs and make up a card to enter. £5 worth of sheets or kits is the minimum order and it would be a good way to start a digital library of card-making designs if you’ve not done so already. The rules are simple Make any Female Birthday Themed card using any download from Craftsuprint! 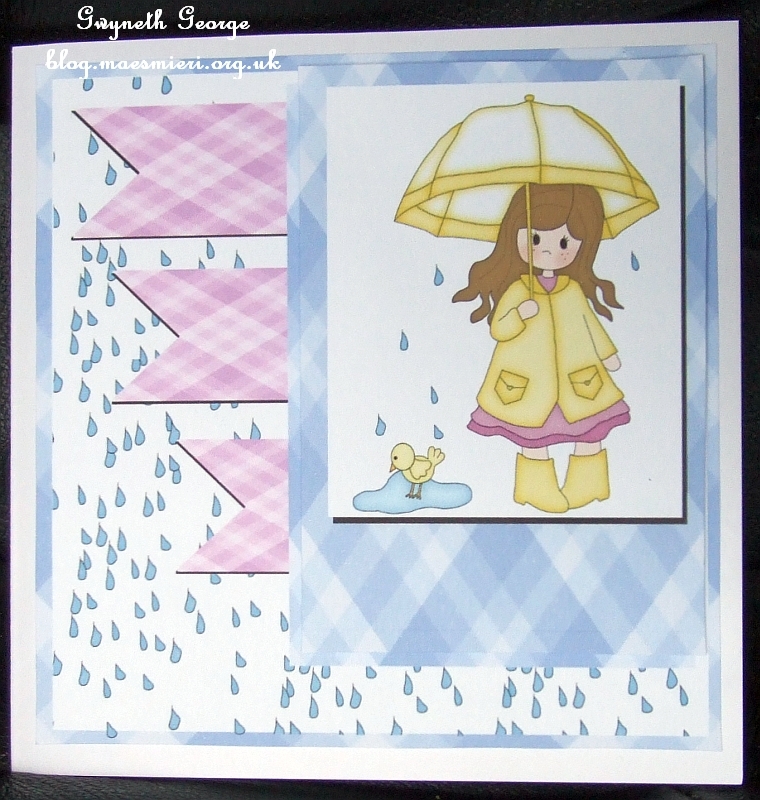 Entry will be open until 24th June and the winner will be announced on July 1st. In my last post I said that I had made my card but was waiting for the rain to stop, and some sunlight to come out, so that I could take a picture of my entry to upload. Well this is now done. So all I’ve got to do now is wait for the voteing and hope I get a few votes. Don’t expect I’ll win as there are some really stunning cards uploaded this time. Craftforums is a great craft forum provided by the lovely team at craftsUprint HQ for crafters of all ability and designers to chat together. So if you are not already a member why don’t you consider joining. If you’ve ever struggled to find just the right design for a card, you know what you want but just can’t find anything suitable, then Craftforums has a great section called “Ask An Expert / Designer” where you can not only ask anybody on the forum if they can help you with a specific problem or query, but you can also put out a request to the designers to see if they can come up with just the right design for your needs. Many CUP customers have been very happy with the positive response from the designers to various requests, so give it a try. Crafty Bobs Bingo – The £100 prize for the Bingo was won yesterday. But never fear, a new game has started and we are currently looking for four corners and the centre for game 47 – the prize being £20. Crafty Bob Treasure Hunt – Bob is still in hiding and the Bob Pot, that goes to the person who finds Crafty Bob waving, is currently nearing £120 – so who’s going to find him this time? Crafty Bobs Tombola – With every order from craftsUprint getting an entry into the tombola, and every entry into the tombola winning a price you can be sure of getting something from the range of prices that goes from a Free Download to a £20 Gift Voucher, so if you do place an order on the site don’t forget to go to the Tombola to find out what your prize is. “Crafty Bob’s Blog” – Don’t forget to check out Crafty Bob’s Blog periodically. Sometimes he puts up discount codes there, as well as information about what’s going on on the craftsUprint site.